We've had a great crop of Padrn Chillies this year, in fact too many too eat as we let them get a little to big and they became really hot! 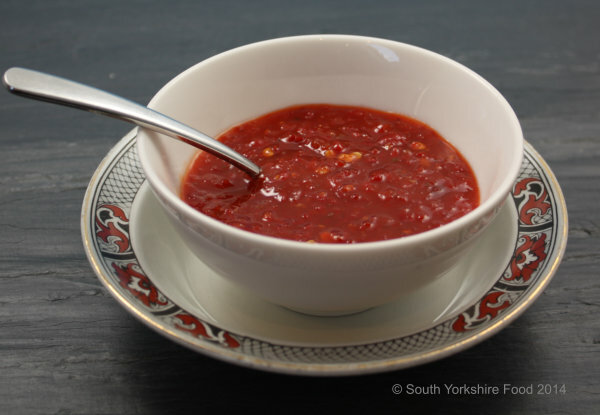 So we let them ripen and turn red and made them into this great sweet chilli sauce. It's got a real kick - who knew Padrns could get so hot. If you haven't got any Padrn Chillies then just use your favourite type. Decide if you want to remove the seeds from the Padrón chillies - we left about half the seeds. The more you leave in, the hotter the sauce. Put the chillies, pepper, garlic, ginger, and about half the vinegar in a food processor, and blend into a thick paste. Add the sugar and remaining vinegar into a saucepan and heat it on a medium heat until the sugar starts to dissolve. Now add the chilli mixture to the saucepan, bring to a rolling boil and cook until the sauce thickens - about 15-20 minutes. Stir occasionally so that the sauce does not catch on the bottom of the pan. Note: the fumes given off during cooking are quite pungent, so try not to breathe them in and keep the kitchen well ventilated. If you find that the sauce is not thickening you can add the dissolved cornflour to the mixture to thicken it a little. Pour into sterilise jars. This will keep in the fridge, unopened for 4-5 weeks.